The 58.6 metre motor yacht Capri, listed for sale by Burgess and Y.CO, has been sold with Burgess representing the seller and Parsifal Yachting introducing the buyer. 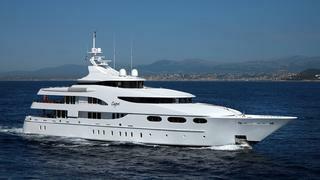 Capri was built in steel and aluminium by Germany's Lürssen yard to a design by Glade Johnson and delivered in 2003. Glade Johnson also designed the interior and executed a concept of sleek, curved features both inside and out. This is a superyacht of voluminous proportions, yet she still maintains strikingly elegant lines. An elegant interior has vast main saloons on the main and bridge decks and there is a fully equipped gym on the sun deck. iPads operating a Crestron app offer individual local control in each cabin and entertainment area. Each area has its own satellite receiver for Sky television in addition to movies and music on-demand through a Kaleidescape audio/visual server. Capri completed her Lloyd's Class 10-year survey during a maintenance period in 2013. She has also benefited from the addition of a completely new fully integrated bridge/navigational system installed in 2012. Twin 1,950hp Caterpillar engines give her a range of 6,000 nautical miles and she is fitted with Naiad zero speed stabilisers.